Saint Mary cannot mediate for you to God. *Scripture quotations are from The Catholic Edition of the Revised Standard Version of the Bible, copyright © 1965, 1966 National Council of the Churches of Christ in the United States of America. Used by permission. All rights reserved worldwide. Mary is not God as is Jesus Christ, who is the incarnate Son of God. You should be seeking God through His Son Jesus, who together with God the Father, is the same One God. Jesus is risen alive. Mary is not. Mary will be made alive at the coming of Jesus together with all the other true believers in Jesus. She is not alive in the body yet. There is no proof she can hear you and there is no Biblical evidence that God has raised her up as an intercessor. The Roman Catholic Church did not even declare the “Assumption of Mary” doctrinally until Pope Pius XII very late in 1950 A.D. The expression “what is written” mentioned here is common in the Bible and refers to the Holy Scriptures themselves alone as it does elsewhere in the Bible. These other writings are beyond what is written in the Holy Scriptures. You err by directing your prayers to Mary. If you believe you are getting answers by prayers to her, it could NOT have been Saint Mary answering you. Since you would be going beyond “what is written” by praying to her, who do you believe would be speaking to you? The devil is a deceiver. 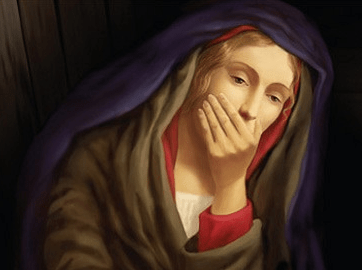 If the Roman Catholic Church says that Jesus Christ is the Mediator between God and men, where do they come off by saying Mary is a Mediatrix? Pray to God solely through His Son.